Eddy Martin wears red high top Converse “Chuck Taylor” All Stars in the film. Things in San Ramos go through quite a change when Jose Maldonado comes to town. 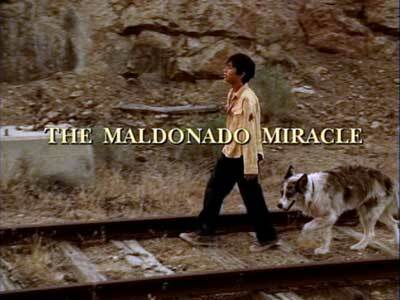 As The Maldonado Miracle opens, we see eleven-year-old Jose Maldonado (Eddy Martin) and his dog walking along the railroad track headed toward San Ramos, a small border town of 400 people. All is not right with young Jose. 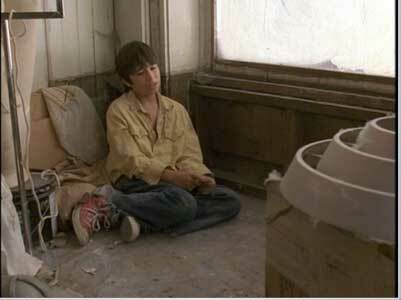 He has a wound on his left arm, has no backpack or supplies with him, and except for his dog Patches he is alone. But San Ramos is in equally sad shape. Through a series of quick dissolves and transitions, we quickly learn that that town is dying. Everything seems run down, the shops are nearly empty or abandoned, the church is in need of repair, and people are moving out. The remaining townspeople have troubles also. The sheriff (Dan Merket) who also runs the local gas station must deal with his aging mother who can no longer take care of herself. Maisie (Mare Winningham) who owns the local cafe looks out on empty booths, with only a few regulars as customers. Tavern owner Cruz (Rueben Blades) provides the only night life in town for the few people willing to venture out. Even the local priest Father Russell (Peter Fonda) is discouraged with his ministry in San Ramos, and has applied for a transfer to another parish in the diocese. His young assistant. Brother Amos (Scott Michael Campbell) seems ill-equiped to replace him. Jose and Patches run away when the sheriff sees that he is hurt. Through a series of flashbacks, we learn that Jose is an illegal immigrant whose mother has just passed away and he has come across the border to try and find his father. His father came to the United States in the previous year, has been out of contact with his family, and is not even aware that his wife has died. Jose has had a difficult time on his journey, escaping from the border patrol a couple of times, dealing with an unscrupulous border smuggler, who demands extra money for tranporting Jose’s dog, talking to unsympathetic labor contractors who could care less about helping him locate his father, and having run-ins with another immigrant who rummages through Jose’s backpack, steals his money, and later stabs him in the shoulder. As Jose comes into San Ramos, the first person he runs into happens to be the sheriff, who sees his wounded arm, and wants to know if he is hurt badly. Jose and Patches run away and take sanctuary in the town church, where they are able to elude capture by hiding in the scaffolding above the crucifix statue in the church. After the sheriff has left, Jose decides to spend the night there, and removes the makeshift bandage on his wound, dripping some blood on the scaffolding. In the morning, he is awakened by the practicing of Brother Amos, who is trying to improve his horrible singing skills. At his first opportunity, Jose leaves the church and seeks a better place to hide out, in an abandoned store downtown. 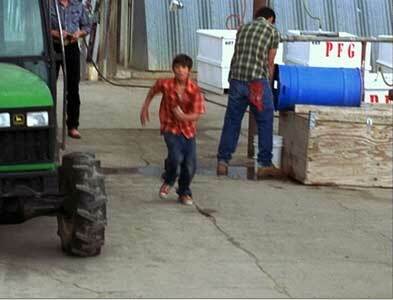 Jose runs over to a group of workers when he thinks he spots his father. That morning Josephina (Soledad St. Silaire), one of the church’s few remaining parishoners, goes into the church to pray, but upon seeing the statue goes running out of the church shouting “Miracle, miracle!” The reason: the statue has drops of blood on it and it appears that Jesus is shedding real tears of blood. Word of the miracle quickly gets out, and suddenly the town experiences a revitalization, as people and the media flock to San Ramos to see the statue. Josephina sets up camp in the front of the church, and eagerly tells her story to anyone who will listen. People are buying souveniers, filling up the church pews, leaving prayer requests, and spending money in the local businesses. Although Father Russell is reserved and cautious about the miracle, asking that everything be tested before saying anything for certain, the town leaders are not. They want the phenomenon to continue, and after the sheriff and others figure out that the boy must be responsible for the blood dripping, they conspire to catch him and get him out of town before he can tell the truth about what has happened. They don’t want anything to interfere with the prosperity that has suddenly arrived in town. Meanwhile, Jose has made an friend of his own. He has stopped by Maisie’s cafe, and politely ordered donuts and milk a couple of times, even remembering to tip her 25 cents, although he could ill afford it. Maisie takes a liking to him, and tells Father Russell about him. Father Russell is able to track Jose down to the store where he is hiding out, and eventually gains the boy’s trust. There are several sub-plots that deal with how residents react to the events, and discover things about themselves. But the main focus of the story is about miracles. What is the real truth about the bloody tears on the statue? Is this a real miracle or just a hoax? Or is the real miracle the sudden revitalization of San Ramos? What will be its ultimate impact on the people of San Ramos and the life of young Jose Maldonado? The remainder of the film deals with these issues. Father Russell reaches out to Jose, bringing him food and offering his assistance. The Maldonado Miracle is the directorial debut for Salma Hayek. She keeps the film moving along at a well-crafted pace, which is no mean task given the predictable story line. While the two main themes of the film, the plight of illegal immigrants and how our society responds to unexplained spriitual phenomenon do not explore any new ground, the characters in the story seem believeable. The best performances are by new-comer Eddy Martin, as young Jose, and Reuben Blades and Mare Cunningham as the two townpeople who develop an unlikely romance. Peter Fonda gives a serviceable performances as the doubting parish priest who reediscovers what his true mission in life is, and Soledad St. Hilaire is charming as the devout parishoner whose life takes on new meaning when she discovers the miracle. While the viewer’s ultimate opinion about The Maldonado Miracle probably will have more to do with one’s personal beliefs than how impressed you are with the story, the film does have a number of memorable moments and certainly material for an interesting discussion about faith and morality in our modern society. When he hears what has happened in the church, Jose climbs the scaffolding to check it out himself. Jose feels completely alone when his dog is captured by the sheriff. 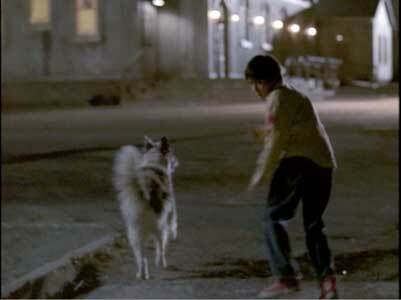 Eddy Martin in his role as young Jose Maldonado wears well-worn red high top chucks throughout the film. While there are not a lot of great closeup shots, red high top chucks are always going to stick out in any cinemaphotography. As the story progresses, Jose’s chucks end up being one of his few possessions that he is able to hang onto during his journey to find his father. The best chucks scenes are when Jose is hiding out in the abandoned store in San Ramos. Jose hides out in an abandoned store in San Ramos. The Maldonado Miracle. (2003) Peter Fonda, Mare Winningham, Ruben Blades, Eddy Martin, Bill Sage, Dan Merket, Soledad St. Hilaire, Scott Michael Campbell. Directed by Salma Hyeck. Categories: Drama, Family.